To complete the install of the Total Cost Involved front end, I primed and painted the Mustang's frame and cross member parts and control arms and got the fasteners organized. 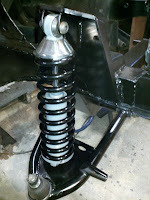 I started the installation with the lower control arms and coil-over shocks. This was extremely easy. Its just a matter of bolting the parts in place. No adjustments needed. Next came the upper control arms. This was also simple but required some thick washers to be added for setting the initial camber. This step was followed by installing the pre-assembled spindles. 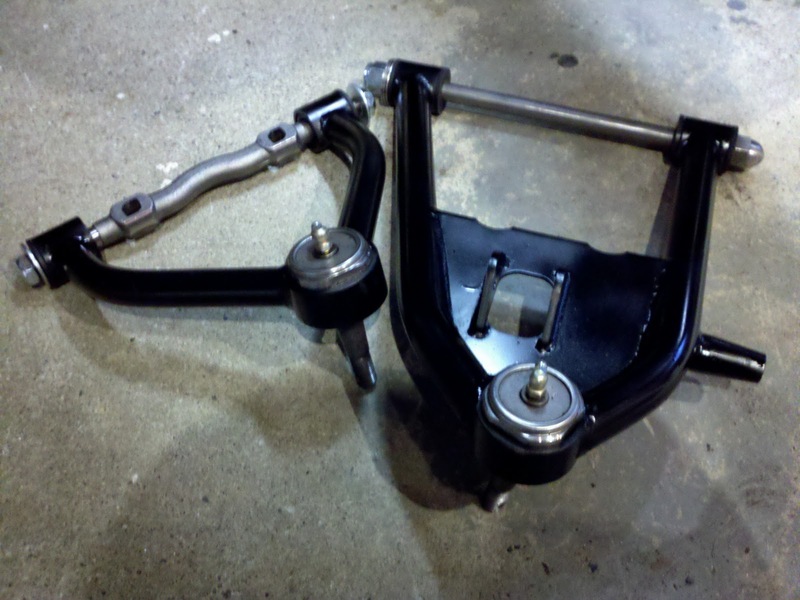 When I ordered the front end kit from the dealer, Ryan at Stang-Aholics, I opted for the basic disc and caliper and it comes ready to install with bearings packed and calipers and pads already in place. 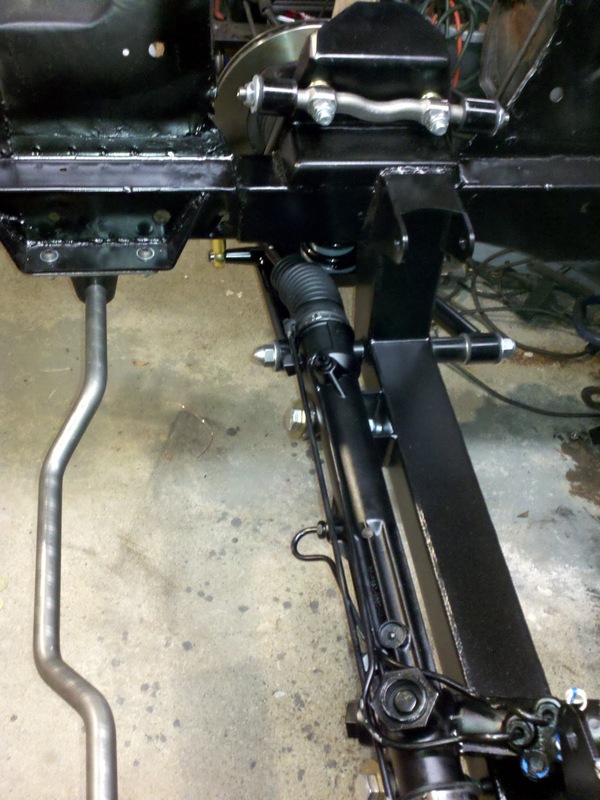 After that, I installed the power steering rack. 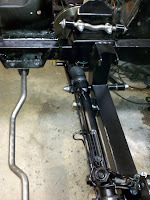 The rack needs to be steered to the center point on the range so that the steering wheel will be centered. 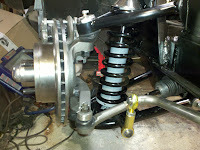 At this point I set the toe-in to roughly 1/8" at the rotors and spun the tie-rod ends on to equal turns and attached them to the spindles. Lastly, I installed the sway bar. I decided to leave it a steel finish and clear coat it. Finally, the suspension install is complete and ready for the engine and wheels. Just in time since I need to push the car out of the garage to do some electrical work on the house. Next, after painting the firewall and the rest of the floor underneath, I will be installing the RJM Injection EFI harness and the ECU. 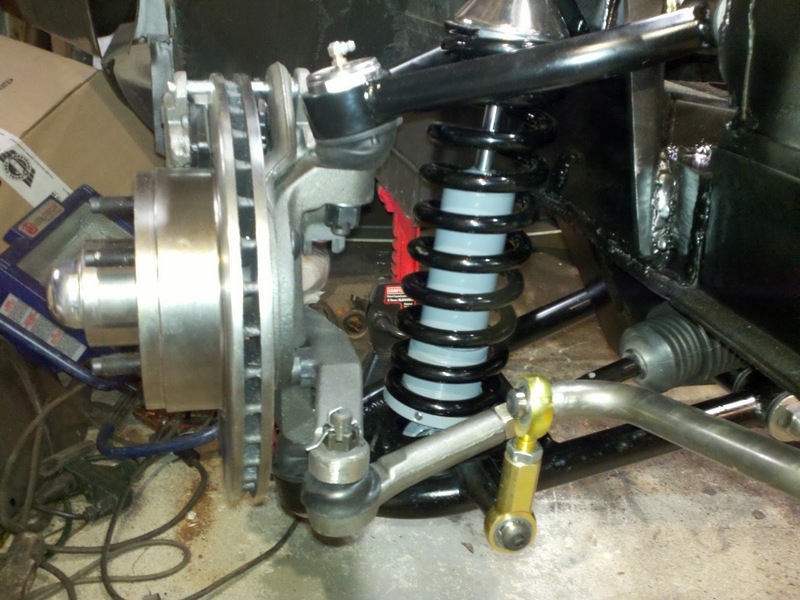 You'll be amazed at the difference the modern suspension parts and rack make in the driving experience. When I did it, the car was completely transformed! Money well spent. I didnt have a chance to drive the car before I started working on it so I dont have an idea of before and after. I can imagine what it was pretty sloppy.